Overtime. Non-exempt employees who work over 40 hours in any given work week are entitled to “time and a half” or 1.5 times their regular hourly wage. Whether or not an employee is “exempt” is determined by multiple factors including a “duties” test as well as a salary threshold. In New York City, employers with 11 or more employees must pay their employees a minimum of $13.00 per hour. New York City employers with 10 or less employees must pay a minimum wage of $12.00 per hour. On Long Island and in Westchester Counties, minimum wage is $11.00 per hour. Everywhere else in New York State, minimum wage is $10.40 per hour. These amounts are scheduled to increase every year for the next few years. Time Records/Payroll Statements. In some instances, the failure to maintain proper records and to issue appropriate payroll is as damaging to the employer as the actual failure to pay wages. All non-exempt employees are to be paid hourly. The employer must track employee time through some timekeeping device, and the employee’s wage statement must reflect his/her hourly rate and the hours that he/she worked on a weekly basis. 4. Cash Payments. Cash payments in and of themselves are not unlawful. Tax issues aside, the failure to properly document the cash payments is where the inherent risk lies for the employer. Absent an employee acknowledged document indicating the cash payments, there is no way for an employer in a contested litigation to be able to prove the wages were paid. 5. Misclassifying employees as independent contractors. Liability for misclassification may arise under various federal and state labor, employment and tax laws. In New York City, additional laws apply to freelancers. 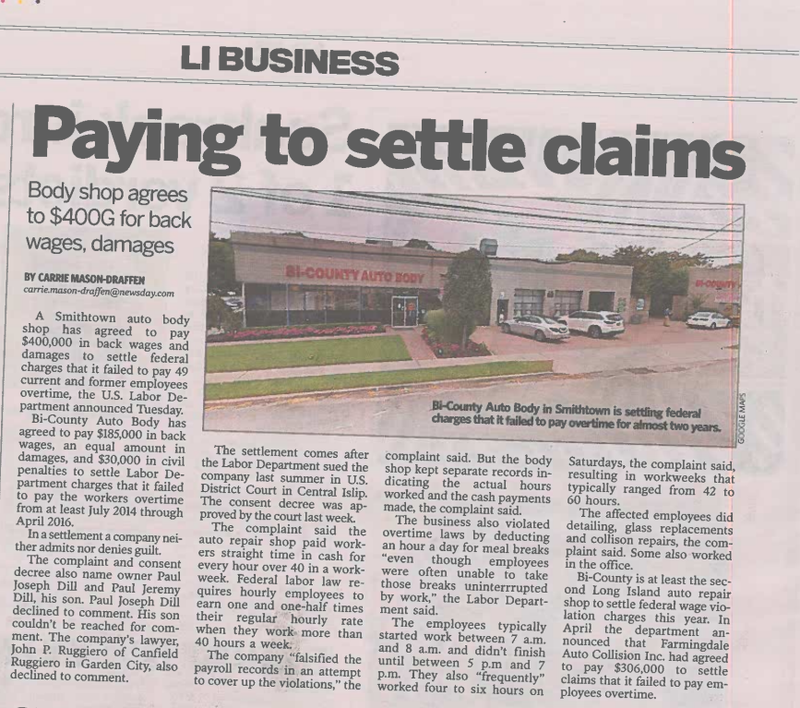 Don’t be the subject of the next story in Newsday. Contact us about reviewing your payroll practices to help ensure you are in compliance.